There’s a reason The Butcher’s Daughter appeals to a designer like me. Founder Heather Tierney describes herself as a designer first, so when creating restaurants from scratch, thinks about the design first. Here, she created a back story about a daughter rebelling against her butcher father by creating a 21st century vegetable-centric shop. 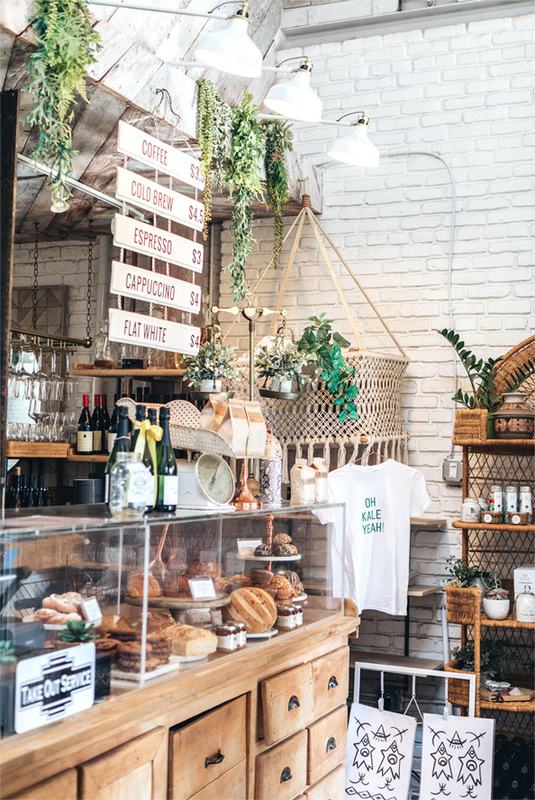 The concept caught on in New York’s stylish Nolita neighborhood, and now Venice, Calif., where, in addition to salads, sandwiches and smoothies, diners can also browse a Cali-style mix of beauty products and fitness gear. 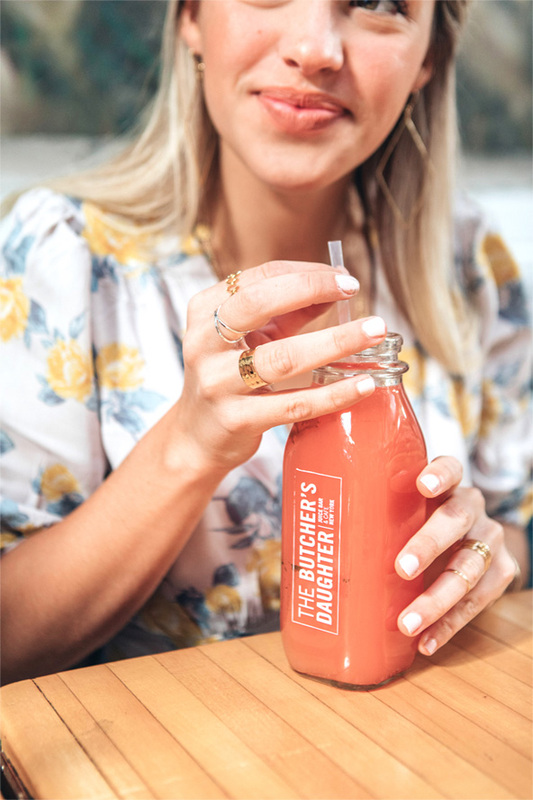 Flying in from Hawaii, I come here to rehydrate with cold-pressed juices in jewel tones with such evocative names as “Rubies in the Dust” (beet, carrot, ginger, plum, flax seed and rosemary) or “Eastern Promise” (lemongrass, pear, cucumber, ginger and kaffir lime). In the morning you can pick up a bread basket of bakery selections such as vegan croissants, rosemary fig scones, ricotta danishes or kouign amines. 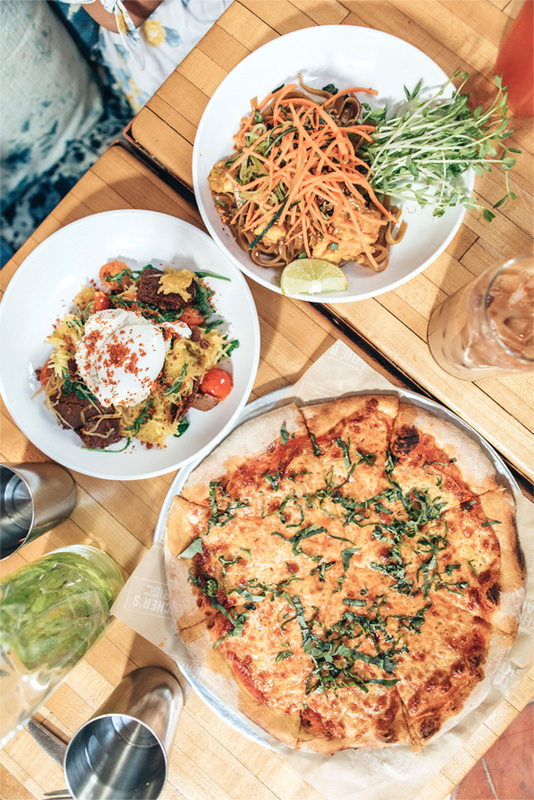 Later in the day you’ll find pizzas, sandwiches and wraps including a bahn mi with seared cauliflower and mushroom pate, and Butcher Bowls of grains, greens, noodles or rice that add up to a picture-perfect Instagram-able dish . The Butcher’s Daughter is at 1205 Abbot Kinney Boulevard, Venice. [ki-ele] Organic rings and Athena Large Diamond earrings. Water Flower heritage juice, with watermelon, fennel cactus pear, honeydew, lime and lavender flower. Pad Thai handmade rice noodles, thai basil, pea shoots, peanuts, tamarin thai, scrambled egg and topped with cucumber-carrot salad. Margherita Stone-Oven Pizza housemade red sauce, mozzarella and basil. Coffee to go and bakery selections include croissants, scones and danishes. [ki-ele] Organic jewelry layers at The Butcher’s Daughter.